We are happy to announce that the Mundus RPG Core Book has been released in DriveThruRPG! It costs 20$ (~15€). It can be bought from here. Send us feedback and share your stories and opinions on our Facebook page or send us mail. We are happy to announce the official release of Mundus RPG! The Mundus RPG Core Book can be purchased from here for 15 € (~20$). The Core Book will also be released in DriveThruRPG in the near future. Additionally we have released the character sheet at our home page. We’d like to thank everyone involved and all of those who supported us during the last two and half years! Today we have big news regarding Mundus RPG. We have signed a publishing deal with Northern Realms (www.northernrealms.net) and we have finished the 416 page Core Book. As we mentioned in Facebook the Core Book is going through the final review by Northern Realms. You should expect a digital release in the very near future. The book will be sold on Northern Realm’s web page and in the future we plan to release it in DriveThruRPG. We are not currently planning a physical release but it might be possible if the digital version generates enough profit. Feel free to ask us questions via email or on our Facebook page or here. In today’s blog post we give a short description of how enchantments work in Mundus RPG. Enchantments are divided into two main categories, weapon enchantments and apparel enchantments. In addition to these two categories the same principles of enchanting can be applied to other objects as well. For example, enchanting a book with the “Eternity” enchantment can make it nigh impossible to be damaged or destroyed by conventional means. Weapon enchantments are the main focus of Mundus RPG’s enchanting system. These enchantments are divided into main enchantments and secondary enchantments. As the name suggests, main enchantments provide the main arcane effect for the weapon. Most common effects are weapon speed and damage bonuses. Main enchantments can also imbue the weapon with special powers, such as an ability to duplicate the weapon, shoot fire or other elements and otherwise change the physical abilities of the weapon. Secondary enchantments can be described as “traits” of weapons’. They add either positive or negative effects to the enchantment. Positive effects make the enchanting process harder and negative effects make the process easier. Positive effects include such effects as causing a bleeding check after each successful hit and increasing the character’s maximum jumping distance. Negative effects can drive the wielder to bloodlust and imbue a demon into the weapon. Apparel enchantments are applied to clothing, armor and other wearable objects. These enchantments give the character much smaller benefits compared to weapon enchantments as our design philosophy is to keep characters from becoming more powerful by just hoarding magic items. The weapon ignores 2 fatigue and 2 injury points from the wielder of the weapon. If the weapon is destroyed it starts to slowly regenerate. This regeneration process takes one day to fully reconstruct the weapon. A completely melted weapon or a weapon ground to dust cannot regenerate. Each successful hit with the enchanted weapon causes a Bleeding check to the target. Please keep sending blog topics and questions to our Facebook page or to our email. Mundus RPG has two types of dragons. The first type is the wurm dragon, which is the european style dragon, and the second type is the serpent dragon, which is the Asian style dragon. Both dragon types have similar behavior and their main difference is their appearance. Also, wurm dragons tend to be noticeably stronger whereas serpent dragons are more agile and they possess a mythical ability to fly without having wings. In Mundus RPG dragons are a sentient race and they should not be confused with a traditional RPG monster just guarding a treasure in her cave. Just like few other sentient “animal” races, dragons are able to take a humanoid form after they reach maturity (or if they are born in their human form). When a dragon takes her humanoid form for the first time, the humanoid form usually takes a heavy influence from the people the dragon has seen. For example, if the dragon has lived in Tentaika she is very likely to look like a Tentaikan in her human form. Dragons rarely have their own communities and instead they tend to blend in to human/cero/sedeum communities. As dragons are usually intelligent, very powerful and nigh immortal they tend to rise to important positions if they wish to. In fact, there are many dragons as lords and ladies. Few of the more notable ones are Serus, Lord of Bane; Kiyohime, Lady of Revenge; Bakunawa, Lady of Eclipse and Murleus, Lord of Chasms. Each dragon also has an element which she can change her genki into. 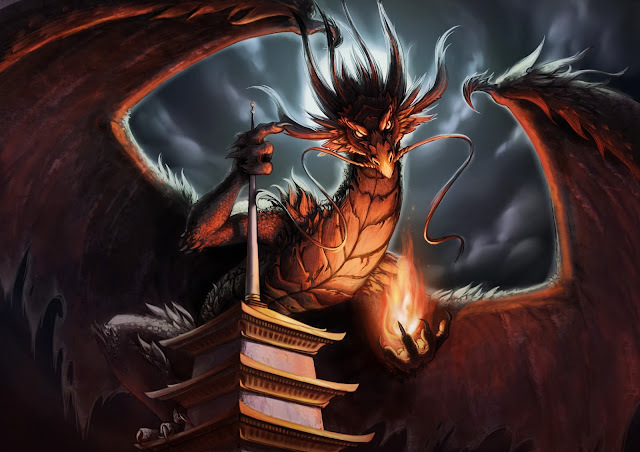 Dragons also receive a bonus into their ritualism skill with rituals of their element. Their scale color also reflects their element. These elements include fire, ice, lightning, shadow etc. You can find more about dragons, their character creation modules and their elements in the upcoming Mundus RPG core rule book. Next week we’ll have a blog post about enchanting. Feel free to send additional topic requests and questions to our Facebook page, email or to here. Our lead designer Ville attended DigiExpo last weekend. 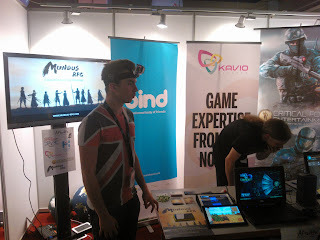 DigiExpo is not the ideal place to promote a tabletop role-playing game but nevertheless it was a fun experience and surprisingly many people were interested about Mundus RPG. "Kajak Games booth with some of our fellows"
The project itself is nearing the end of production and only few things remain to be added to the book. Proofreading and layout design are also progressing nicely and the artwork is pretty much done. We are hoping to get everything done by the end of this month. We received a request from players to share some rituals and creatures so here is a small sneak peak to rule book. The creature we are sharing with you this week is the Akaoni. It is a common Tentaikan demon and actually a quite strong one. If you try to take down an Akaoni with the example characters in the Quick Start you’d better be well prepared as they have taken down unwary demon hunters before. We also share four rituals with you. We have three offensive rituals from Inmicus, God of War and a single support ritual from Terra, Goddess of Earth. As these rituals are quite basic it is rather easy to convert them for other deities if you wish. For example, to create a version of Hell Arrow for Lumia, Goddess of Moon, just convert it to deal Energy damage instead of Fire damage, make it look shadowy and call it something like Shadow Arrow. As we mentioned last week Ville, our lead designer, is going to attend DigiExpo next weekend. If you are in Helsinki area, stop by the booth and have a talk. Ville is sharing the booth with Kajak Games so if you don’t see Ville around just ask the Kajak guys to give him a call and he’ll gladly come to have a chat (unless he is in the line for PS4 :P). If you have any lore or gameplay questions feel free to ask them here in our blog or in our facebook page. We’ll try to answer them the best we can. Akaonis are an ogrish demon race and they often have a red or reddish brown skin and they are roughly three to four meters tall. Scholars believe that akaonis are somehow linked to Rengoku, one of the eight hells. They lead a nomadic lifestyle and they move across the lands in small tribes. Akaonis are most common in eastern Tentaika and they prefer open plains and light forests. They often steal cattle from villages or threaten villagers to give them food. Sometimes the akaonis might kill or enslave humans, on the other hand akaoni tribes living in harmony with secluded villages which keep the onis happy with occasional sacrifices are not unheard of. This ritual requires a corpse of a dead animal or other being as a target. The ritual detonates the corpse and creates a gory explosion that deals CHA x2 (m20) Piercing damage in 2 point clusters up to a 5 meter radius. Add the detonated corpse’s size modifier to the damage and blast radius. The Corpse Explosion ritual defiles the dead and is a condemnable action, especially if the defiled person was an important figure. Casting the Corpse Explosion often leads to severe punishment in Tentaika. The caster releases a transparent jagged energy blade towards a single target. The caster gains an additional +1 to the ritualism attack roll. The ritual deals CHA (m10) Energy damage to the target and it can cause a bleeding effect. The caster hurls off a flaming bolt. This ritual deals CHA (m10) Fire damage to the target. The Hell Arrow can be used as an arrow or a bolt with Archery weapons. This ritual hardens the ritualist’s skin. The ritualist gains 2/2/2 armor rating. This does stack with Perks, Traits or other abilities which grant natural armor. However the Stone Skin ritual does not stack with other rituals or channeling effects. The Stone Skin armor rating grants only halved rating to locations where the character wears armor. This ritual lasts CHA minutes. The crunch continues and most of the rules are now written down and finished. Currently we are hunting down little missing things and doing last minute fixing. As always with large projects, we would like to start everything from the beginning, however we are very satisfied with the current condition of the game. 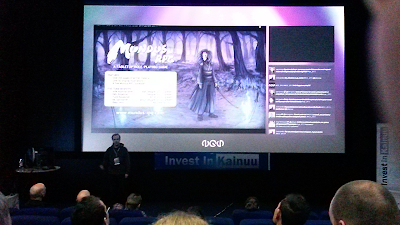 As a short notice we are planning to attend this year’s DigiExpo in Helsinki. Please visit our booth if you are in the area! We have continued crunching and the rule book is coming along nicely. Unfortunately because of the tight schedule we have not had time to prepare a proper blog post for this week. Instead here is a small status update. During this week we have written demon and creature descriptions. Also roughly half of the GM chapter is done and the descriptions of Tentaika’s prefectures and most important samurai clans have been updated for the book. This week has been a busy one. We are in crunch mode to get the game finished in time and currently we have only the Game Master and Lore chapters left to write. 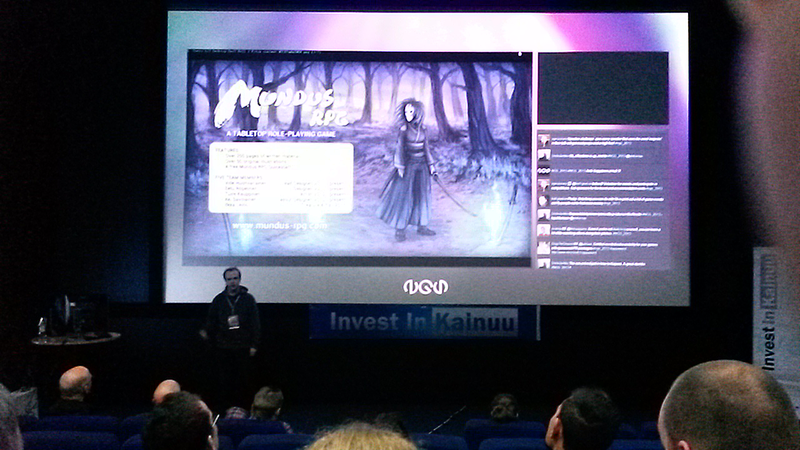 We also attended the Northern Game Summit this week, where our lead designer Ville pitched the Mundus RPG in a pitching competition. Unfortunately we didn’t win the contest but all in all we enjoyed the two days of NGS. 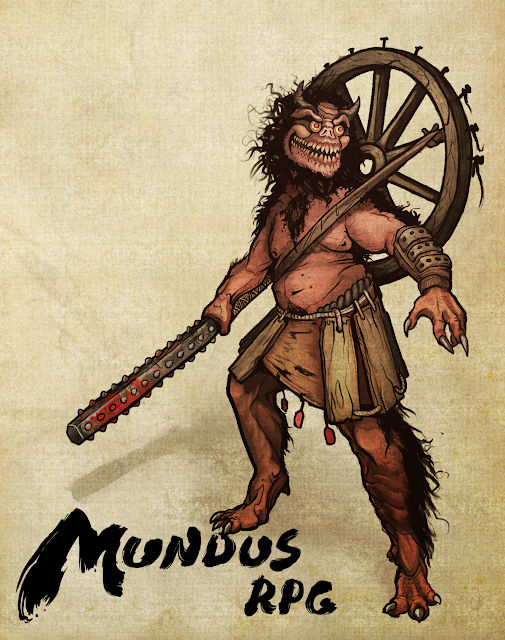 Developer blog of Mundus RPG. Here we share the news and information of Mundus RPG and Tentaika.